Four years ago I spoke at Mansfield (Ohio) Correctional Institution, to 175 inmates about redemption and freedom. This is Ohio's largest prison, and was formerly the "Shawshank Prison." They are next to one another. How strange it was for me to see Shawshank after having watched the movie a few hundred times. I kept expecting to see Andy or Red or the warden walk around the corner. Redemption. What a beautiful word! I love that my church family is called "Redeemer." Yes, Andy and Red finally get free from the prison's physical constraints. But the movie is really about inner freedom, and release from inner demons that torment and imprison the soul. That's the beauty of this movie. It addresses the longing of every human heart. 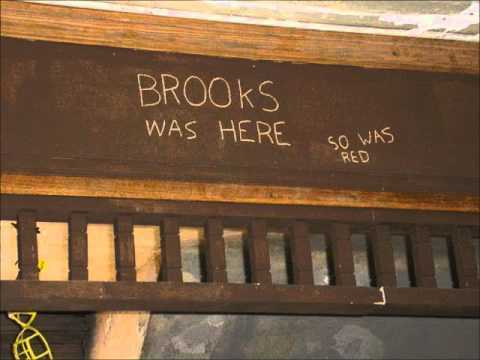 And that's what, sadly, "Brooks" never got free of. This is not mere theory, but experiential reality, flying in the face of the atheistic approach to death as exemplified by, for example, Julian Barnes. I have been with many people as they were dying, and as they died. I've known many who lived their human lives as branches connected to the Vine (which is Christ). In such people I see hope, and expectation that is not of their own creating. It's Christ in them, the hope of glory. In Christ there is life. Life Now. Carve these words on your soul: Redemption is here.